In this post we will familiarise you with the way a protein is made, in this case the FMO3 protein. The DNA has the coding for the amino acid sequence, that is transcripted into long RNA and then processed into short RNA, which is then converted into the final sequence of amino acids that make up the required protein (in this case the FMO3 protein). 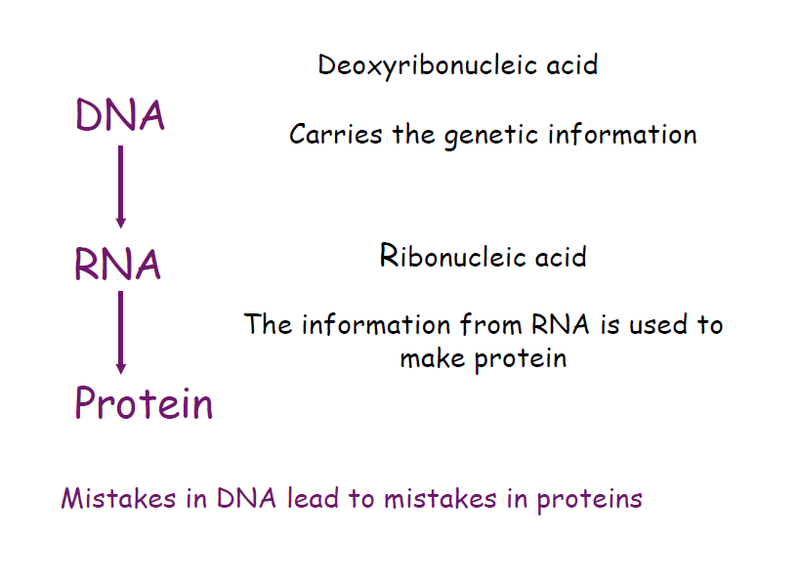 DNA has the coding part on exons, which has the relevant information to make the FMO3 protein, but also contains introns which are currently a mystery and it is not known if they are needed. Some may regard introns as mostly junk DNA. Unfortunately, while introns seem to play no obvious role in building the protein, it seems likely that having mutants/variants amongst the introns can still negatively affect the formation of the correct full protein. 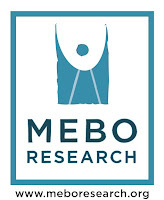 This may explain why some people seem quite obvious genetic TMAU cases in the urine test, but the DNA test does not seem to show any mutantions. The DNA test usually only checks the coding region of the FMO3 DNA in the exons, and not the introns. In FMO3, there are 9 exons, of which 8 (exon 2-8) are regarded as the coding parts. Probably most DNA tests will check these 8 coding regions specifically. 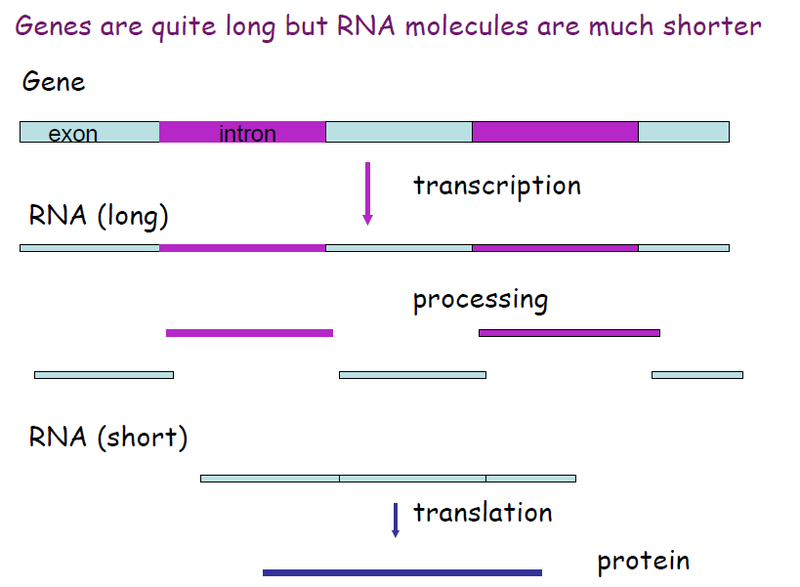 As can be seen from the slide above from Professor Shephard's slideshow (full video can be seen in the sidebar), The DNA is transcripted to long RNA and then processed into the short RNA form which does not contain the introns, and only contains the exons. It is now ready to code the amino acid sequence to build the FMO3 protein. The RNA is the part which has the sequence for the 532 amino acids needed to build FMO3 (the DNA coding being much longer including introns). Looking at the terminology geneticists use, it can be seen that sometimes they refer to e.g. 668 (which obviously is higher than 532) because it is referring to a mutation/variant on the DNA strand (which is much longer), which corresponds with a fault at amino acid 223 (which means it is referring to the position on the final protein or short RNA of 532 amino acids). It seems that nonsense mutations produce a 'false' stop to the production of the 532 amino acids. 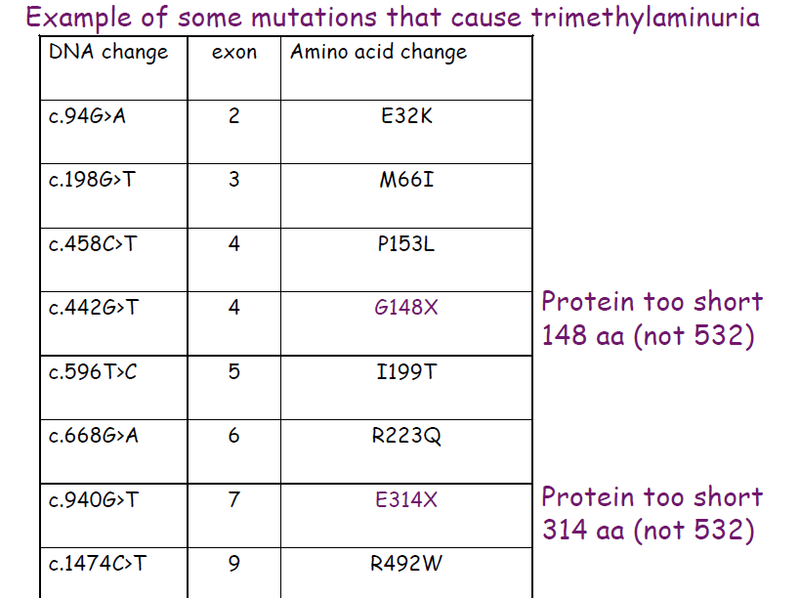 These make up about 5% of the known genetic TMAU mutations currently known. The drug 'Ataluren' is hoping to be able to over-ride false stops in nonsense mutations and allow the full protein to be formed. 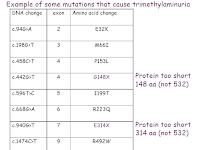 The other FMO3 mutations/variants are mostly 'missense' mutations, where the wrong amino acid has been coded for a certain position in the 532. 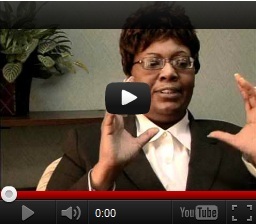 A full overview of the genetics of FMO3 can be seen in the video given by Professor Shephard in the sidebar.